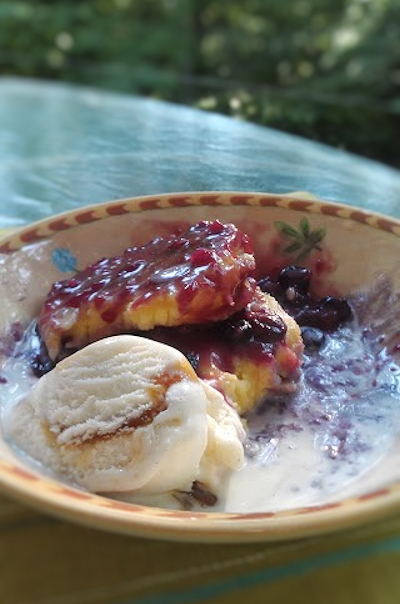 This was a treat for my step father as I was reading that any type of pudding ( a dense wet cake) is a treat after dinner time for him so I thought I would give this one a whirl and stir it up a little with my own blueberry peach preserve sauce. Now first let me say that you can cook this two different ways. 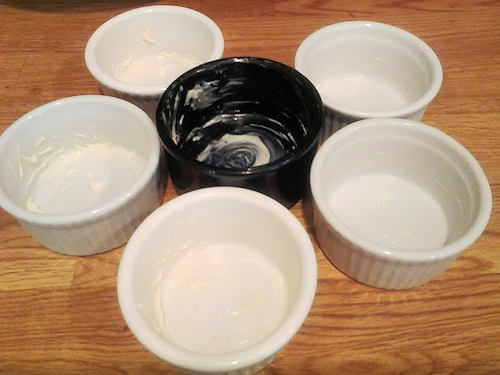 You can either microwave for about 4 min per two ramekins checking them all the way every minute to make sure they do not get over done OR you can bake them in a water bath on 350 for about 40minutes until golden brown and spongy to the touch. I microwaved but had I had the time I think I would have tried baking. Regardless, they came out wonderful! 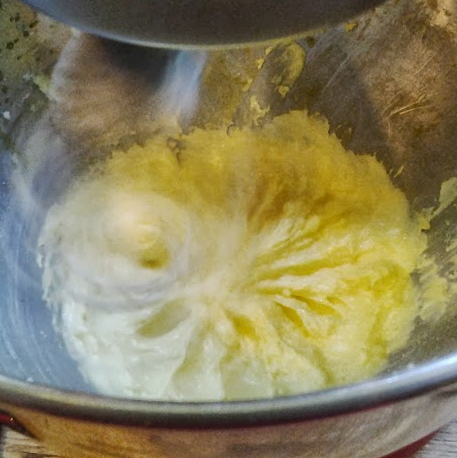 First thing you do is cream the butter and the sugar together. 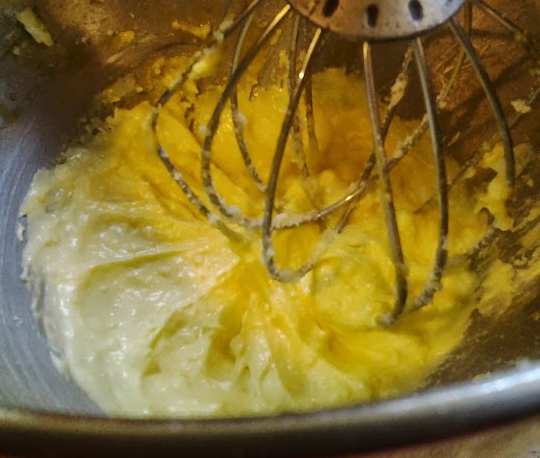 Then add the egg yolks in one at a time and beat in the sugar and egg mixture. 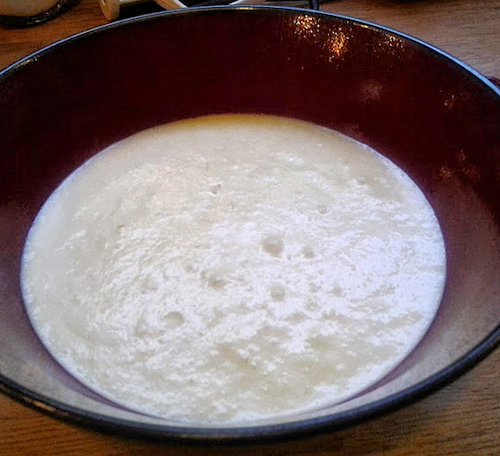 Add the flour, salt, lemon and zest into the blending once more, then add the milk blend together and set aside. I only had one mixer so I had to put in a bowl and wash my mixer. 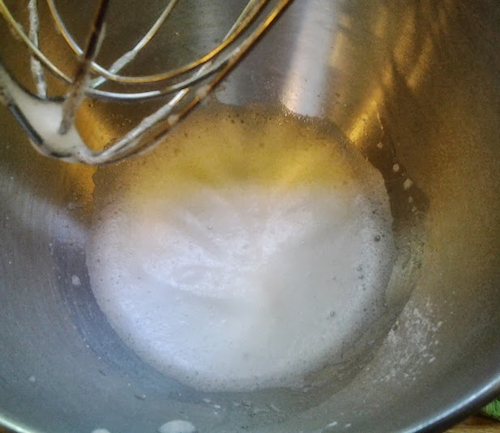 I then added the whites into the Kitchen aid with the cream of tartar and whipped. 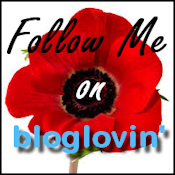 Just until foamy. 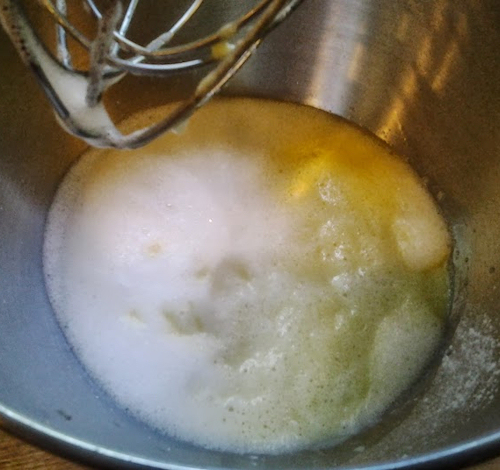 Then I added the mixtures together and whisked on low just folding in the whipped whites. 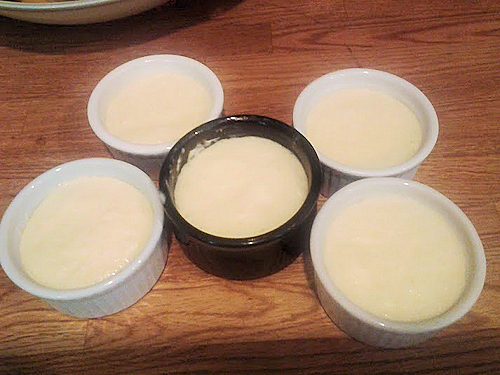 Next I buttered my 6 ramekins and pour in the mixture about 1/2 way full. Then popped them into the microwave and let them steam. 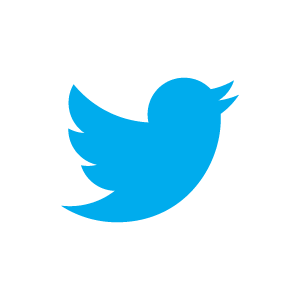 Remember I started with one minute increments. Now at this time if you DO NOT want to microwave get out a deep oven safe dish fill about half way with water and place the ramekins in the water bath. 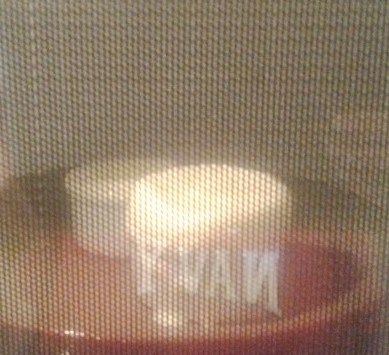 They ramekins should have water about half way up. You will bake this at 350 for about 40minutes. See how they puff up? When done, if you you touch the top, it should have a spongy like consistency, bouncing back to the touch. When you take them out set aside to cool, they will fall. Don’t be sad, it’s natural 🙂 . When you are ready to plate, just slide a butter knife around the edge and flip out. Next I started my sauce. 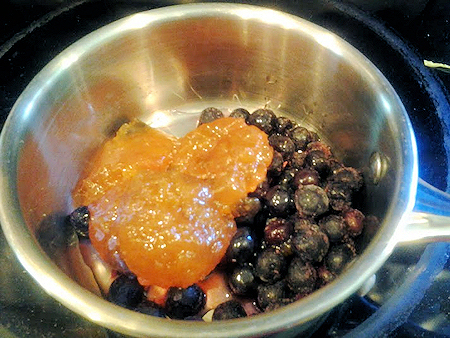 I added the peach preserves and blueberries to a sauce pot and simmered. 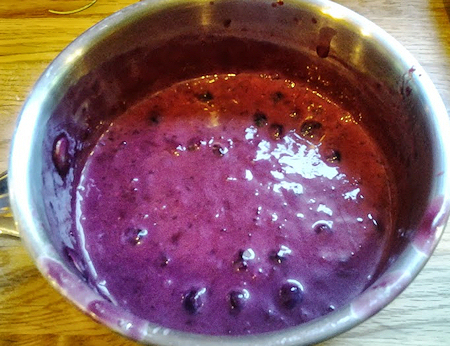 When the two blended together nicely, I added in the whipping cream, corn starch and Knox gelatin as I wanted this to be like a thick sauce and not watery. 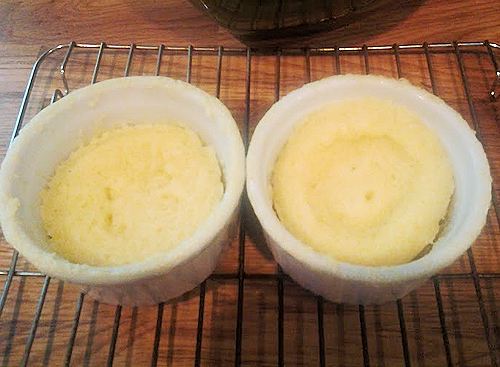 Take your sponge pudding cakes and cut in half putting the sauce on each layer. I topped with some frozen honey vanilla frozen yogurt and it was lovely out on the porch enjoying the weather. Note: If anyone chooses to bake this I would love to hear the comments as I plan on doing it that way next and maybe changing up the sauce flavors with lemon strawberry.